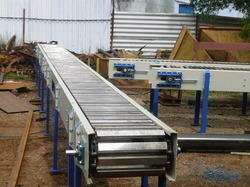 Prominent & Leading Manufacturer from Coimbatore, we offer bottle slat conveyors and slat conveyor. Our company has achieved the milestone in offering Bottle Slat Conveyors to the clients. 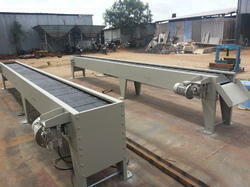 Bottle Slat Conveyors can be customized as per the specification detailed by esteemed clients. The offered range is designed by the skilled workers with the help of optimum grade raw material and sophisticated technology in accordance with the standards. These products are widely appreciated by clients for optimizing tensile strength and other related attributes. The offered range is stringently tested by quality analyzers on various parameters to make sure flawlessness and defect-free delivery. Our range of material handling equipment comprises Slat Conveyor which is used or heavy as well as light duty. These high quality slate conveyors are made from high quality raw materials which ensures high durability at its user ends. The slats are useful for conveying heavy loads of heated materials. This product is manufactured in compliance with international quality standards using excellent quality raw material and cutting edge technology. We are the leading manufacturer and supplier of Slat Conveyor in Tamilnadu, Kerala, Coimbatore, Tirupur, Karur, Salem, Chennai etc.